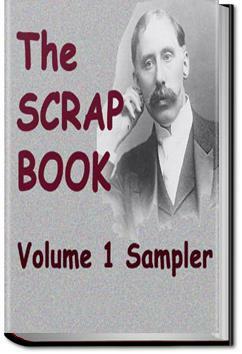 18 works -- two non-fic articles & one short fiction or poetry each -- from issues March, April, May, June, July, & August 1906 of The Scrap Book, Volume 1, edited by Frank Munsey. As he states in the editorial of the April 1906 issue (Vol 1, Iss 2) this was a sort of supplement to the editor's popular monthly, Munsey's Magazine http://en.wikipedia.org/wiki/Munsey's_Magazine. The Scrap Book is very like an American version of Punch with many short, often humorous articles interspersed with at least one short story, some poetry, and several longer non-fic pieces. . . .There is perfect order, perfect discipline, and yet every man of that regiment thinks!" "All for all, and every one for the best of which he is capable—the best morally, mentally, and physically."